"TO BIG BAD WOLF DE LITTLE RED RIDING HOOD... ELIMINATE HIMMLER... IMPERATIVE... COMPLETE MISSION WITHIN 24 HOURS... OUT." That's what the message you received from Allied Command said after you decoded it. It was delivered by a French courier an hour ago, along with a map and coordinates of Himmler's last known location. Chances are the SS chief has already moved from there, but the trail is still hot enough for you to follow it if you don't waste any time. For years, SS and Gestapo blackshirts have terrorized all of Europe, crushing millions under their marching jackboots. Now the time has come to cut off the head of the snake -- namely, Reichsfuhrer-SS Heinrich Himmler. And you've got twenty-three hours left to do it. Will it be enough? 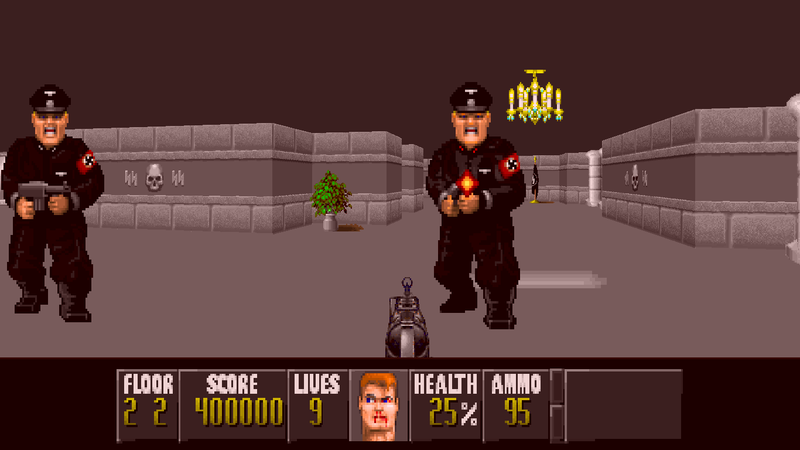 This is a port of Laz Rojas' Mac Wolf3D scenario "Die, Himmler, Die!" to ECPort. Aside from packaging up this mod and adding the missing sounds, this also makes the mod work with the PC Wolfenstein files, rather than the Mac files. Sounds from second resource left out, kind of pointless, with exception of final boss, but schmeh. run "ecwolf --file himmler_data.bin himmler_fix_PC.pk3"
Thank you for keeping Laz's work alive. I've been wanting to play these for ages. Do you plan on porting his other scenarios or just his Deluxe Scenarios? Yeah, without your ports we might otherwise never be able to experience these great Wolfenstein 3D mods. Thanks again AstroCreep! Taylor13212019 wrote: Thank you for keeping Laz's work alive. I've been wanting to play these for ages. Do you plan on porting his other scenarios or just his Deluxe Scenarios? Most of his earlier mods work (and are included with) the macwolf mod loader and pc files(https://forum.zdoom.org/viewtopic.php?f=42&t=62740) although some won’t load and all will crash at the end due to there being no map info. All will work with ecwolf if you have MacWolf.